Set in the 29th century, the novel documents a pilgrimage to the planet Hyperion, undertaken by eight people whose lives have been altered due to events regarding that world. The pilgrims intend to travel to the Valley of the Time Tombs, where the Shrike, a metallic creature alleged to grant one wish to the members of a pilgrimage, dwells. Each of the seven adult pilgrims has a wish that, if granted, could change the future drastically, and the events that the pilgrims experience on Hyperion could have major influences on their society, creating additional issues. The Hyperion Cantos is influenced strongly by various works, including the teachings of the environmentalist John Muir and the poetry of John Keats, to the extent that a reincarnation of Keats narrates The Fall of Hyperion. The novel also contains explicit references to classical literature and modern writings, including the scientific works of the Jesuit and paleontologist Pierre Teilhard de Chardin, the physicist Stephen Hawking, and some of the fiction of author Jack Vance. The universe in which the novel is set relies heavily on high technology. The planet Hyperion, one of the novel's major settings, is a protectorate of the Hegemony of Man, an interstellar governmental entity formed during a mass exodus from Earth, known in the novel as the Hegira. The Hegira was sparked by the apparent destruction of Earth in an accident caused by sentient artificial intelligences. These artificial intelligences were members of the TechnoCore, an immense assemblage of these personae that has "seceded" from its creator, humanity, to which it serves as a type of advisory body. The artificial intelligences can appear in a series of computerized realities, based on cislunar spheres, that are also accessed by humans, but as a type of internet; however, the true residence of the TechnoCore is unknown to the Hegemony. Despite this fact, relations between the two entities are strong, and the TechnoCore has granted a complex form of technology, the farcaster, to the Hegemony, allowing for humans to step through a portal from one location to another, even if the two are separated by great distances. Numerous planets have established large amounts of farcaster connections with one another, forming the "WorldWeb", which is the core of the Hegemony. As the level of technology progresses, so do the religious views of the WorldWeb populace, which is mentioned to adhere largely to a hybrid religion of Zen Buddhism and gnosticism, although a significant minority belong to cults such as the Church of the Final Atonement, which worships the Shrike and the retribution it believes the creature will bring upon society for humanity's past errors. The almost-forgotten Catholic Church nevertheless plays a major role throughout the novel, as one of its priests is among the pilgrims to Hyperion. The government of the Hegemony is described in detail during the course of the novel, and its role in the fictional universe forms several portions of the plot. Planets with full membership status in the Hegemony select senators to serve in the upper house of the legislature, while the lower house consists of the All Thing, a forum accessible to all citizens through "implants" that connect humans to the "datumplane", one of the computerized realities resembling the World Wide Web. The executive branch consists of a chief executive officer elected by the Senate. At the time of the novel's events, Meina Gladstone serves as the Hegemony's chief executive officer. Despite the democratic tendencies of this parliamentary form of government, the Hegemony has at times taken actions viewed as tyrannous, using its small but elite military, known as FORCE, to invade the sea planet Maui Covenant, which had resisted integration into the Hegemony as a protectorate. Planets not incorporated into the Hegemony are nonetheless affected by it, and its ambassadors effectively administer some planetary governments. Still, some worlds, thought of as the "Outback", are sparsely settled. The planet Hyperion is viewed as part of the Outback, but is viewed with special regard due to the succession of strange events that have occurred on it since the formation of the Hegemony. These events include colonization efforts that have failed due to the menace of mysterious forces, correctly believed by many to have been the work of the Shrike. The Hegemony is opposed by the Ousters, renegade human colonies that fled the Hegemony's growing influence even before the events of the Hegira. Though seen by many Hegemony citizens as barbarians, the Ousters have a highly advanced culture that focuses primarily on the fine arts and on aesthetic values almost unknown amidst the many technologies of the WorldWeb. The Ousters have mutated physically, believing that they should adapt to their outer-space surroundings rather than adapt the surroundings themselves, as was the case with WorldWeb planets, and appear in a variety of forms throughout the course of the novel. The Ousters have rarely fought full-scale conflicts with the Hegemony, but are launching an invasion of Hyperion at the time of the novel. Keats – The capital of Hyperion, Keats is named for the poet John Keats, and was once the residence of the Consul, when he served as de facto ambassador to Hyperion. The Poets' City – The center of a failed colonization attempt by an expatriate "kingdom" of artists several hundred years before the events of the novel, the city was abandoned after the Shrike caused the death or disappearance of many residents. A colossal palace complex stood near the center of the city, and the events of the novel occurring in this location happen within the palace ruins. Keep Chronos – Often referred to as Chronos Keep, this is a castle built by the settlers of the Poets' City to serve as a type of hotel. After the abandoning of the region, the Keep was claimed by the Church of the Final Atonement. It is mentioned that several priests of the Church, often called the "Shrike Cult," disappeared there after fleeing from Keats. The Labyrinth – Like eight other worlds, Hyperion contains a labyrinthine structure built directly below the surface. The Tree of Pain – The Tree of Pain, or the Thorn Tree, is a great structure that is out of phase with time. The Shrike impales his victims on the tree to writhe in agony for all time. Martin Silenus – Silenus is a poet who has lived for centuries due to advanced technology and the coma-like cryogenic fugue state. Silenus was born into an aristocratic family on Earth, during the Hegira, and was later among the settlers of the Poets' City. He believes that the Shrike is his muse, as he is able to write epic poetry only during the presence of the creature. The Consul – The Consul is a Hegemony diplomat whose home world, Maui Covenant, was invaded by FORCE during his youth. His grandparents sparked an unsuccessful but legendary rebellion against Hegemony rule, but his father became a Hegemony senator, and the Consul followed his father into the governmental structures of the entity that drastically changed their homeland. The Consul remains bitter toward the Hegemony, and has served as an erstwhile agent of the Ousters at times. He believes that he is responsible for the "opening" of the Time Tombs, due to actions he took while serving as consul on Hyperion. Brawne Lamia – The daughter of an influential Hegemony politician who was killed by the TechnoCore under the guise of a suicide, Lamia is a private detective who carries with her, in a neural implant, the persona of her "cybrid" lover, the first reincarnation of John Keats. It is through this persona that the narrator is able to "dream" the pilgrims' experiences. Sol and Rachel Weintraub – Sol is a Jewish ethics professor, and his daughter Rachel, a former archaeologist, has been aging backwards since she was touched by the Shrike while researching the Time Tombs. Sol has compelling dreams to hand over his now-infant daughter to the Shrike. Having spent a portion of his life trying to understand the dilemma of Abraham when ordered to sacrifice his son Isaac, Sol has come to believe that the sacrifice of an "innocent" is unacceptable, but nevertheless travels to Hyperion. Fedmahn Kassad – Formerly a senior FORCE officer, Kassad has had encounters, both in computerized simulations and during an interlude on Hyperion, with a woman called Moneta, who appears to be the Shrike's "keeper" and eventually became Kassad's lover. After a bizarre transformation in which Moneta appeared to become the Shrike, Kassad fled, vowing to kill Moneta and destroy the Shrike. Het Masteen – Masteen is a captain of a "treeship," an interstellar passenger craft belonging to the Templar Brotherhood, an exclusive society dedicated to the preservation of nature. The Templars are secretly aligned with the Shrike Cult and have sent Masteen as their representative on the pilgrimage. He is also directed to "pilot" the Shrike's "Tree of Thorns," on which the creature supposedly impales his victims. 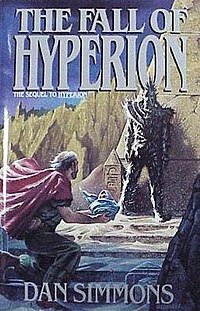 Masteen disappears during the events of Hyperion, but reappears near the end of the novel and is found at the beginning of The Fall of Hyperion. Father Lenar Hoyt – A Roman Catholic priest, Hoyt wears the cruciform, a parasite that resurrects its host continuously, until the host has atrophied into an asexual, mentally impaired being. Hoyt's mentor, Father Paul Duré, was assimilated into a tribe of cruciform-wearers on Hyperion, called the Bikura, who planted a cruciform on Duré. Hoyt, who wears his own cruciform as well as Duré's, hopes to die so that his mentor may yet again live. Joseph Severn/John Keats – The second of two "cybrid" reincarnations of the poet, "Severn" updates CEO Gladstone on the fates of the Hyperion pilgrims and effectively narrates the novel through his vivid dreams. Meina Gladstone – Gladstone is the chief executive officer of the Hegemony and is a former senator and protégé of Brawne Lamia's father. Gladstone is often compared to Abraham Lincoln, Winston Churchill, and a fictional politician called Alvarez-Temp. Senator Gabriel Kolchev – Kolchev is considered to be among the most powerful Hegemony senators, and is a supporter of Gladstone's faction. He succeeds Gladstone as chief executive after the fall of the WorldWeb, but is forced to flee due to the ensuing chaos. Theo Lane – Lane succeeded the Consul on Hyperion after the latter retired; he is now the Governor-General of the planet, since admitted to the Hegemony's Protectorate. Lane is described as a bookish, bespectacled man. Ummon – Ummon is a leading figure in the TechnoCore's "Stable" faction, which opposes the eradication of humanity. He was responsible for the creation of the Keats "cybrids", and is mentioned as a major philosopher in the TechnoCore. Councilor Albedo – Albedo is a member of the AI Advisory Council, the organ of the TechnoCore that advises the Hegemony leadership circle. He serves as the Council's spokesman, and appears as a holographic projection. Councilor Nansen – Nansen serves as the Council's primary spokesman toward the end of the novel, and takes on a holographic form intended to create an impression of trustworthiness and reliability. Coredwell Minmun is an Ouster spokesperson who participates in the tribunal that judges the Consul for his prior actions against the Ousters. Freeman Ghenga is a more senior Ouster leader who also participates in and seems to preside over the tribunal. Monsignor/Bishop Edouard – Edouard is a confidante of Father Duré and a prestigious Church figure. True Voice of the Worldtree Sek Hardeen – Hardeen holds the most prestigious position in the Templar Brotherhood, and is described by Father Duré as the equivalent of a pope. The Shrike Cult Bishop – The Bishop, unnamed in the novel, is the leader of the Church of the Final Atonement. Among the Hegemony's most wanted men due to his role in inciting riots on the planet Lusus, the Bishop is mentioned to die after the fall of the farcasters, trapped with numerous acolytes in a suddenly airless cavern. During the events of Hyperion, the pilgrims traveled to the Time Tombs while retelling their stories, which proved in each case to have been the storyteller's motive for participating in the final Shrike Cult pilgrimage. At the beginning of the novel, the pilgrims wait as a sandstorm occurs in the valley. Father Hoyt, hoping to die to relieve himself of the intense pain inflicted by his cruciform, staggers to one of the Tombs, the Jade Tomb. Here, he attempts to commit suicide, but is killed by the Shrike before he can do this. Brawne Lamia, who noticed Hoyt's disappearance, traces him to the Jade Tomb and encounters the Shrike. She fires at it with a pistol, but it is unharmed and disappears. Kassad observes these events quietly, hoping to lure the elusive female Moneta and the Shrike into his presence, so that he may confront and potentially kill them. The surviving pilgrims demand that the Consul command his AI-controlled starship to come to the valley, supposedly so that they can use the medical supplies on board to attempt to save Father Hoyt, who has lost too much blood and is nearing brain death. The Consul is reluctant to do so, but he finally relents, only to find that the ship has been placed under interdict by Gladstone and the Hyperion authorities. They decide to take refuge in the Time Tombs from the storm. Meanwhile, Kassad begins to follow the other pilgrims into the tombs and is attacked by a mysterious sniper he assumes to be Moneta. In response he lays waste to one of the tombs called the Crystal Monolith, where the last shots had originated. He rushes the damaged tomb while under heavy fire that destroys his armor and enters, ignoring the attempts of the other pilgrims to contact him. The next morning the remaining members of the pilgrimage wake to find that Father Hoyt's body had been resurrected into Father Paul Duré. The Consul provides his notes of the group's stories to Duré to bring him up to speed. Kassad finds Moneta at the top of the Obelisk. She does not remember him as she has moved backwards in time since they met. He attempts to shoot her but his gun will not work in the crystal tomb. As he wrestles with her, attempting to kill her, she continues to ask him why he wants to kill her. They fall to the floor below and she dons the quicksilver armor. Kassad makes a killing blow with his power suit, but it is ineffective against the strange armor. After ripping his armor off and knocking him senseless she rapes him. Afterwards she takes him into the tomb and gives him the quicksilver armor. The Shrike appears and takes him through a portal it created in the air. After searching the tombs once more for their missing people, and running low on food, the pilgrims delegate Lamia and the poet Martin Silenus to travel to Keep Chronos and the Poets' City, respectively, to find food. Silenus goes to the Poets' City to complete his "Hyperion Cantos", but is instead surprised by the Shrike and impaled on the Tree of Thorns, which is revealed to be partially real. Lamia, at Keep Chronos, recovers the necessary supplies and returns to the Valley, but is also attacked by the Shrike and loses consciousness. She awakens at the fringe of the TechnoCore, in one of its computerized realities, in the company of her implanted John Keats persona. Lamia and the Keats persona converse with a major AI named Ummon, which reveals some of the motivations of the TechnoCore and the existence of a war between human and AI ultimate intelligences. As the conversation concludes, the Keats persona is killed by Ummon, and Lamia is released into unconsciousness. Kassad finds himself with Moneta, overlooking the city of Keats while the Ouster invasion force lands on Hyperion. She explains that it is 5 days in the future and that the Lord of Pain can be controlled by one who defeats it in single combat. Without hesitation, Kassad agrees to fight the Shrike, hoping to gain control of it and use it in the ongoing war. He is transported to a future Hyperion where the planet is desolated and without atmosphere, and all that remains is the thorn tree, the tombs, and hundreds of Shrike creatures. Vowing to save all the victims impaled on the thorn tree, Kassad charges the first Shrike that had appeared to him. Father Paul Duré decides to wait with Sol Weintraub and Lamia's now-recovered, but unresponsive, body, while the Consul uses his hawking mat to fly to Keats, in an attempt to use his former leverage and political connections to free his ship. Instead, the Consul crashes on a river miles from Keats and is taken captive by two thieves. He only escapes death due to the personal intervention of his protégé, Governor-General Theo Lane, with whom he returns to the capital. At the Tombs, True Voice of the Tree Het Masteen reappears mysteriously, revealing Shrike Cult collusion with the Templar Brotherhood before dying and claiming that he and the erg creature he brought with him in the Mobius Cube were to pilot the Tree of Pain through space and time. Shortly thereafter, Father Duré leaves Sol, ostensibly for a "walk," and disappears. Minutes before the time of Rachel's birth and the simultaneous "opening" of the Time Tombs, Sol brings the baby Rachel to the foot of the Tomb known as the "Sphinx," where she is received by the Shrike, who carries her into the building. Severn's character, the second "cybrid" of John Keats, is introduced at the beginning of the novel, at a formal event at Government House on Tau Ceti Center, the primary world of the Hegemony. Here, he claims to be an artist attached to Gladstone's staff in an attempt to provide an artistic view of the beginning of the war for Hyperion, which is under attack by the Ousters. At the event, senior Hegemony officials observe a FORCE fleet departing for the Hyperion stellar system, after which Severn accepts the invitation to dinner of a colorful socialite, Lady Diana Philomel. After the dinner, Severn, intoxicated, is seized by Philomel, her husband, and several associates, who incompetently attempt to coerce Severn into providing classified information. They are interrupted by Hegemony security personnel, who arrest Severn's captors, revealed by Gladstone as royalists with connections to the Shrike Cult. Severn next observes meetings of both the Hegemony cabinet and Gladstone's inner circle, updating Gladstone on the Hyperion pilgrims while still pretending to be an artist. Suddenly, while touring several farcaster-connected worlds between meetings, Gladstone is informed that the Ousters have counterattacked, attacking the WorldWeb itself in an unprecedented and unexpected move that appeared impossible. Since FORCE strategic reserves have been committed to the war in the Hyperion system, the first wave of worlds threatened by the Ouster invasion seem destined to fall. Severn tours several of the worlds, narrowly escaping from a rioting mob that recognizes him as one of Gladstone's associates. As sudden Shrike Cult uprisings devastate major Hegemony planets, Keats travels to Pacem, the homeworld of the Catholic Church, where he encounters Father Duré. Duré had disappeared from Hyperion after entering the planet's underground labyrinth, and was escorted by the Shrike through various places and finally to Pacem, where he sought out his old confidante, Monsignor Edouard, and described the events that he experienced in the past years. Duré, intrigued by the collusion of the Templar Brotherhood with the Shrike Cult, travels to God's Grove, the Brotherhood's home and soon to be within the range of the Ouster invasion armada. Severn, accompanied by Gladstone's aide Leigh Hunt, farcast to Tau Ceti Center, but instead arrive on a world that is an apparent analog of 19th century Earth and, in particular, the city of Rome, where the historical Keats died. Like the original Keats, Severn contracts tuberculosis and his physical form dies, but his persona retreats into the computerized realities of the TechnoCore. The Consul meets with the leaders of the Ouster Swarm attacking Hyperion, which is on the verge of falling to the siege. He is tried for the murder of the Ouster agents he killed years previously, but is not punished, his sentence being to live during the turbulent times that the Ousters believe shall follow the war (a sentence the Consul later compares to the "old Chinese curse", commonly stated as "May you live in interesting times"). He is told that the device he activated early as part of his betrayal is a nonfunctional decoy. The ousters had long ago known how to predict when the Time Tombs would open. Furthermore, the agents he killed are not dead and his treachery was anticipated. The Consul is then informed that there is no Ouster offensive against the WorldWeb, and concludes that the TechnoCore is the only power capable of launching such an attack. The Ousters then offer their support to the Hegemony in their struggle against the artificial intelligences of the TechnoCore, but only in the form of retaliation for the fall of the Hegemony, which they claim is inevitable since the Ousters refuse to use farcasters. Gladstone, who has resolved to use a TechnoCore device against the Ousters while Hegemony citizens temporarily evacuate and retreat into the labyrinths of the worlds containing those features, is sent this information, and also discovers that a FORCE autopsy of Ouster bodies found during a failed counterattack against the invasion armada reveals that the "Ousters" are truly TechnoCore androids. Gladstone retires for a brief time, and, while napping, is approached by Severn in a dream. Having met with his creator, Ummon, Severn has discovered that the TechnoCore resides within the farcaster system, fearing alien intelligences (Lions and Tigers and Bears) to be found in the Void Which Binds, a reality thought of by the Hegemony as a communications medium. Gladstone orders the immediate destruction of the farcaster network, knowing that, despite the inevitable death and chaos that will follow this action, it would cause a cessation of TechnoCore activity. She does so, and resigns as chief executive. Back on Hyperion, Brawne Lamia, who has awakened from her coma-like state, penetrates the Shrike Palace to find Silenus and all of the other victims of the Shrike connected via a long cable. She manages to free Silenus, just as the Shrike appears and prepares to attack her. She mysteriously manages to freeze the Shrike as it advances, and it falls over a precipice and shatters. Meanwhile, Sol's daughter Rachel appears in a newly formed body outside the Time Tombs as a young woman, carrying her younger self (now aging normally again). Giving her younger form to Sol, she explains that she is Moneta, and is now traveling back in time with the Shrike under orders from humanity's future. She disappears and Sol enters the portal to raise the infant Rachel in the far future. Elements of FORCE discover that the TechnoCore invasion has suddenly ceased and that the invasion armada lacks any personnel whatsoever. Throughout the former WorldWeb, chaos breaks out, with shocked Hegemony citizens turning to violence. On Tau Ceti Center, Government House is besieged by a furious assembly of citizens. Gladstone allows herself to be killed by the demonstrators, remaining on the planet even after her de jure successor, Senator Gabriel Kolchev, flees. In addition, the entire fatline communication relay is suddenly shut down by unknown forces, the final broadcast to every receiver being that access has been revoked until humanity is ready to properly use it. The story concludes several months later; the worst of the chaos caused by the fall has abated, and Hyperion is flourishing again, with former Hegemony citizens and Ousters co-existing. Newly substantiated glyphs give some insight to the various tombs and monoliths of the Time Tombs, and, rarely, the portal to the future will admit a person. The novel ends with the Consul returning to the former Web Worlds in his starship to discover what happened, with Severn's artificial intelligence stored in his ship. ^ a b "1991 Award Winners & Nominees". Worlds Without End. Retrieved July 16, 2009. ^ "1990 Award Winners & Nominees". Worlds Without End. Retrieved July 16, 2009. This page was last edited on 6 April 2019, at 14:05 (UTC).